Many people believe that watch accuracy can be achieved by simply adjusting the regulator screw towards the + or – position. Regulating a watch is a lot more complex than this. Watches that are inaccurate are inaccurate for a reason. Generally, these watches require CLEANING AND CONDITIONING (oiling and greasing of the winding mechanisms). Conditioning also includes: ensuring that all of the train wheels are free from obstruction, the hairspring is centered, and the last coil of the hairspring moves freely between the regulator pins. After the above conditions are met, then you can proceed with regulating the watch. Never try and regulate a Dirty watch!! Regulating a mechanical watch means making it run slightly faster or slower, by making a small change in the length of the balance hairspring. The shorter the length, the quicker the balance completes its swing and so the watch runs faster. If the length is made greater, the opposite occurs. This change is made by moving the regulator. 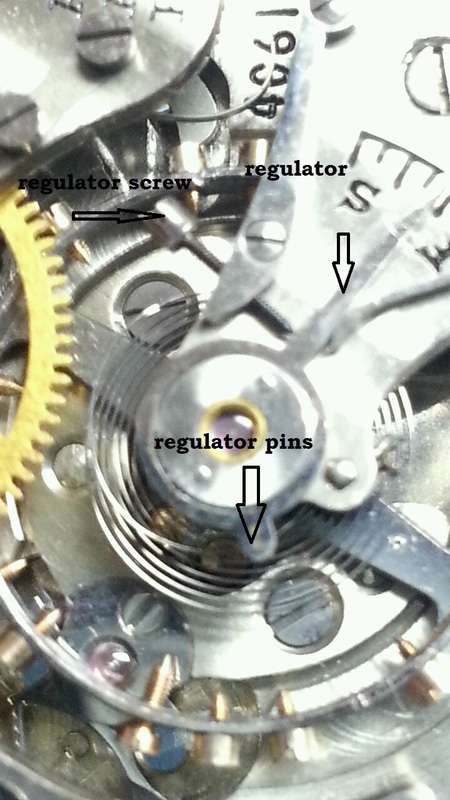 Regulation is done on this Hamilton by carefully turning the regulator screw in or out to adjust the length of the hairspring which will slow down or speed up the timing. This seems like a simple project, just get a screwdriver, turn the screw and you are finished. The problem is that if you slip, your screwdriver goes right into the heart of your watch and you will probably ruin the hairspring, break the balance staff, or both. I get lots of watches in every year that are ruined by someone trying to make a little “adjustment” and then they cause a huge problem. Regulating a Rolex is totally different than on a standard watch. 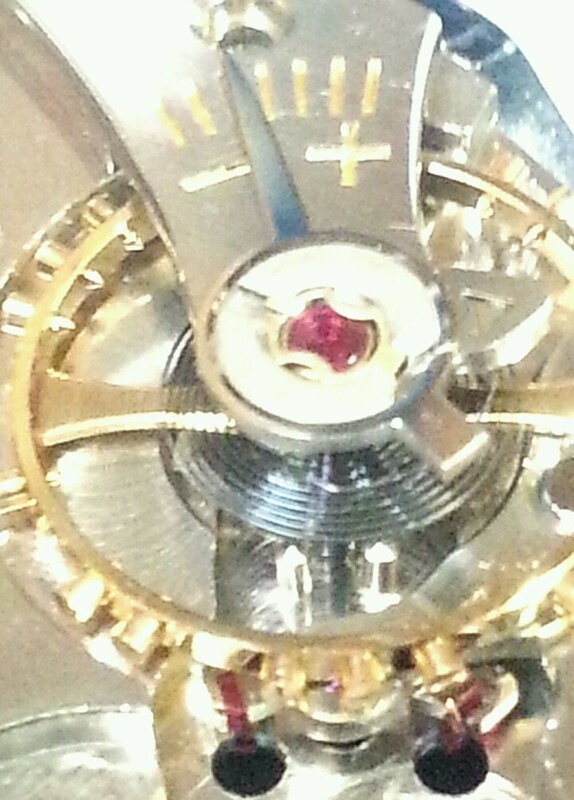 A Rolex is not adjusted by changing the length of the hairspring. The spring length is locked in place, you change the timing by adjusting the weight of the balance wheel. Modern Rolex watches have either 2 or 4 regulator screws on the balance wheel. In order to adjust the time, the screws are turned in (makess the watch run faster) or turned out (makes it run slower). Think of a figure skater doing a spin. When they start to spin, if they pull their arms in, they spin faster, extend their arms out and they slow down. Same principal applies here. The screws are turned by a special wrench that exactly matches the head of the screw. This is quite a fine job to do, you need both hands and a lot or practice. 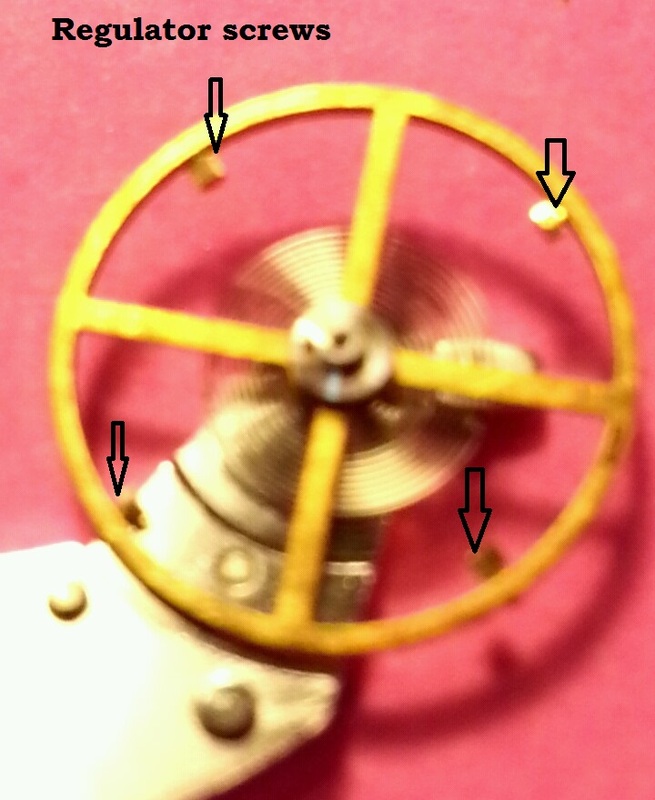 I always remove the balance wheel from the watch to adjust the screws, trying to do it when the balance is in the movement is tricky and dangerous, a great way to break a balance staff. Please keep in mind that just because you have a screwdriver and a case opener, you should NEVER try and regulate your watch. I tell customers very simply, I dont know anything about cars and would never even think of trying to change the oil in my car. Please use that same logic with your watch. Don’t ever open the case back or try and make any adjustments without lots of training, the proper tools and timing equipment. 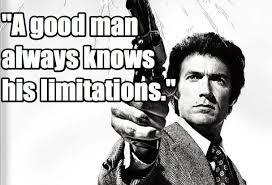 Please try and “know your own limitations”!! Exellent advice. I can regulate my 1947 992b by the way I position the watch when not in use. I don’t carry my watch at work, I’d probably break it. However, when I’m not at work this is my carry watch. If I lay the watch face up on a horizontal flat surface, the watch will gain about 1.5 seconds a day;if I position it stem up it will lose about 1 second a day. Other than springing forward or falling back 1 hour,I have not had to reset the time since Jan. 2014. This morning I was 14 seconds to the fast side. Not too shabby. That’s why I love Hamiltons. Great advice. 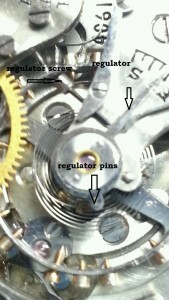 I’ve also found that I can regulate my 1947 992b by changing it’s position when the watch is at rest. I don’t wear my watch to work because I’d probably break it; however it’s my everyday carry watch. If I lay the watch dial up on a horizontal flat surface, the watch will gain about 1.5 seconds a day. If I place it stem up ,it looses about 1 second a day. Other than springing forward or falling back 1hour, I haven’t reset my watch since Jan. 2014. This morning it was 14 seconds fast – not too shabby. That’s why I love Hamiltons. Great words of wisdom. Know your limitations. The easy we can, or should, do, anything more than easy let the people in the know do it and have it done correctly. This is why they go to school to learn how it do watch repair correctly and have access to the correct NOS parts. Excellent advice, Mark. I am a clasical keyboard musician who used to work as a piano and pipe organ technician. Inevitably, it was harder to correct a problem that an inexperienced amateur “fixed”, then called me in to repair it correctly. The watches you have overhauled for me work flawlessly, and can always be relied upon to perform well. I’ve recommended you to friends, and look forward to future projects with you! Yes, you are so right about a watch’s accuracy being more than just an adjustment. I’ve seen many dirty watches come across my bench, and once they are cleaned and conditioned, they function much more efficiently. And, I agree about regulating a Rolex being a tricky job. Taking the time to do it correctly and using the right tool is very important. Thank you for writing these blog posts. I enjoy hearing about your successes and challenges.